In On Writing, Stephen King describes how he writes to Metallica. Most recently I read an interview with him and Neil Gaiman, and King discussed how he writes in his Florida home with his desk facing the wall, away from the distracting windows. Goldberg and King are both touching on the importance of the process and how we keep it from managing us. Ever since Tap Out hit readers’ hands, I’ve had questions about my process and the environment in which I write. Most assume because of the pervasive darkness in my novel that I will lean toward King’s image: sitting alone in a dark room, cranking heavy tunes and hammering away on the keyboard. But first, let me explain how my office came to be. We bought our home while my wife was pregnant with our first daughter and we had no cash; of course during the real estate bubble. Therefore, we grabbed up a two-bedroom ranch with a large enough yard for a future addition. The “spare” room became the nursery, and my wife did not want a traditional theme. She wanted something unisex and something that would last for our second child (we didn’t know the gender of either child until delivery). 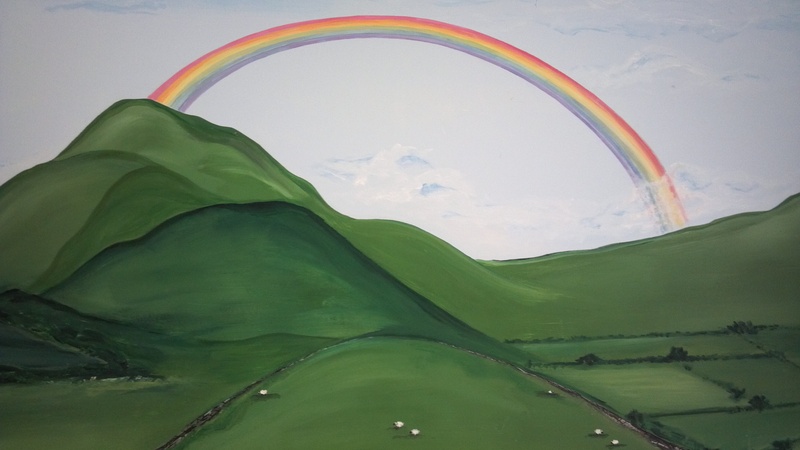 Also, since my wife is 100% Irish, she wanted the room to reflect that, and so why not paint the room like the hills of Ireland with cute little sheep and a rainbow, etc? 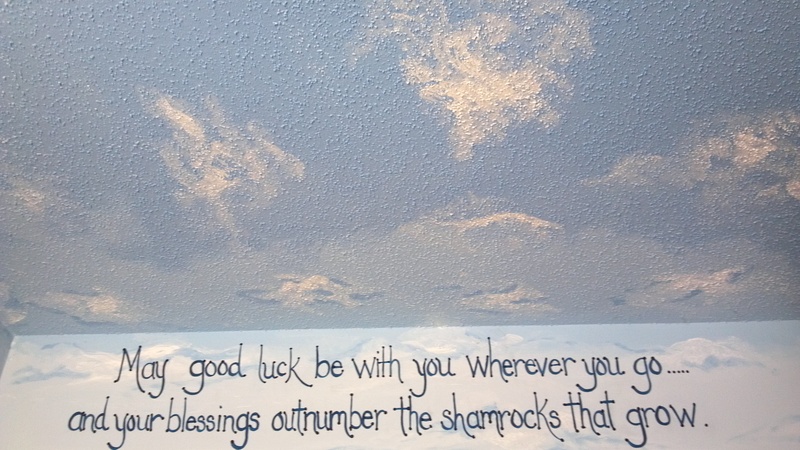 And while at it, why not make it panoramic, painting the popcorn ceiling with a multi-toned sky and puffy white clouds? Of course I said yes, because that’s what you do for your wife in your new home with your first baby on the way. Fortunately, our friend’s sister is a talented artist. 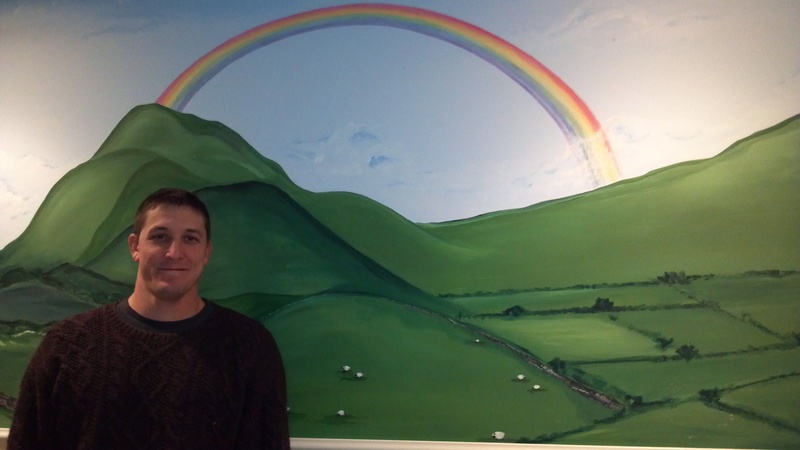 She came and sketched and then painted, and within a week the nursery was complete. And it was perfect once our daughter was snuggled inside. Fast forward three years, the addition has been built, and we now have four bedrooms, two daughters and I get an office. The new “bedroom” in the addition was perfect. Spartan like King’s, painted a peaceful blue, ala Goldberg. Only there was one problem: the windows in the nursery had become excessively drafty. We didn’t have the money to replace both, so a decision was made–paint the office pink, add a cutsie theme and convert it into the new nursery. As for the old? It became my office, complete with a space heater to combat the cold, with the hills of Ireland over my head. So when I write, I guess I implore both the wisdom of Goldberg and King. The room is incredibly peaceful. When I look up while writing a scene, lost with where I want to go or what I want a character to say, I’m faced with serenity, not insanity. And I believe that is what keeps me from getting pulled too far into the darkness within. Because I crank away at my work with a fevered pitch as if Metallica–or more likely Slipknot–is roaring in my ears, but I am surrounded by peace. That balance keeps me sane and maintains the humanity within my work. It is impossible not to. 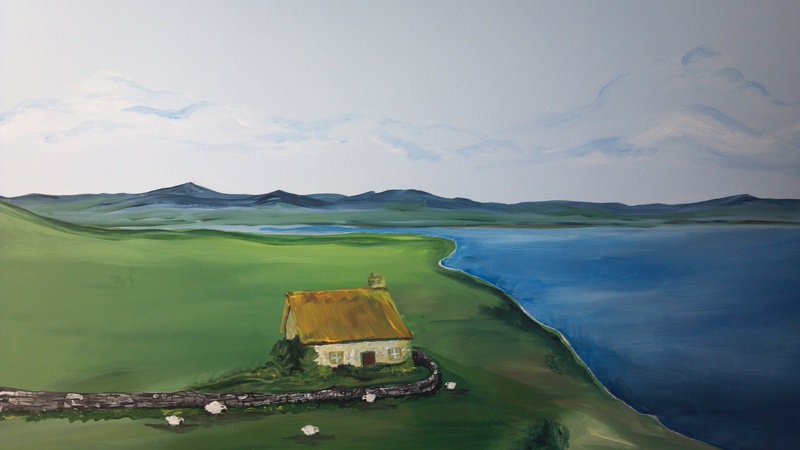 I sit and write in the room in which my firstborn dreamed.